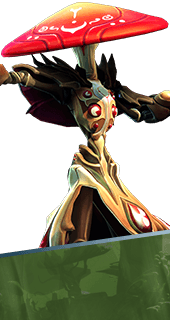 Miko is a Hero in Battleborn. Miko is available to play from the beginning of the game. Miko's kunai poisons enemies on impact, dealing 50-68 damage over 2 seconds. Miko's primary attack hurls a barrage of poison-tipped Kunai, while its secondary activates a Healing Beam that restores health to target allies. Miko has evolved to adapt and survive through natural toughness, rapid health regeneration and the ability to cover ground quickly. Miko gains 260-350 health over 5 seconds. During that time, Miko's healing beam grants 35% more health. Hurl a mushroom to create an area of effect lasting 45 seconds. Allies gain 83-150 health per second while in range. Can be destroyed by enemies. While Biosynthesis is active, healing an ally with Miko's heal beam causes Miko to move faster. +30% Movement Speed. Biosynthesis' healing-over-time effects are extended to nearby allies. A portion of damage dealt to enemy health by Molecular Mycology is returned to Miko as health. +20% Life Steal. Increases all self healing effects of Biosynthesis. +15% Healing. ncreases the firing rate of Miko's Kunai. +20% Attack Speed. Using Miko's heal beam on allies reduces Biosynthesis' cooldown, allowing more frequent usage. -30% Cooldown Time. Fungus Among Us can withstand much more damage before being destroyed. +214 Max Mushroom Health. Fungus Among Us deals damage over time to enemies in range. +78 Damage Per Second.